UNIQUE ONE-OF-A-KIND Antique Door, Vintage Chest and Antique piece of Wainscot REPURPOSED into a Hall Tree with Storage - Storage for Shoes, Boots, Backpack, etc. Your storage options are endless. Great for mud room, entry way, hall or foyer...Free standing, so it can also be used as a Room Divider - Easy to transport/remove nuts & bolts-two pieces. Only $125.00! SOLD!!! 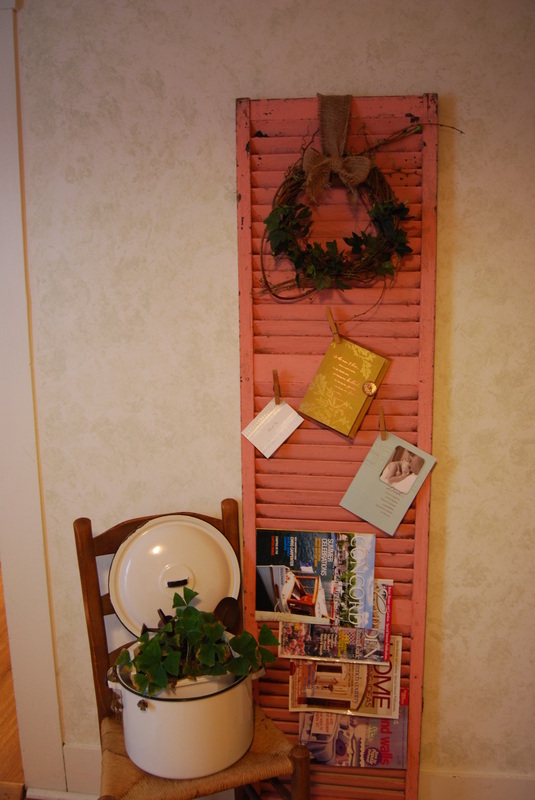 Coral Pink Shutter REPURPOSED Magazine Rack/Greeting Card & Photo Display embellished with wreath of greens WALL DECOR. Yes, it is ready to hang on your wall as it rests on the floor. Great in any room! Only $75.00! - SOLD!! Vintage Meat Grinder REPURPOSED into a Unique LAMP with Burlap & Braided Jute embelishments added to shade. 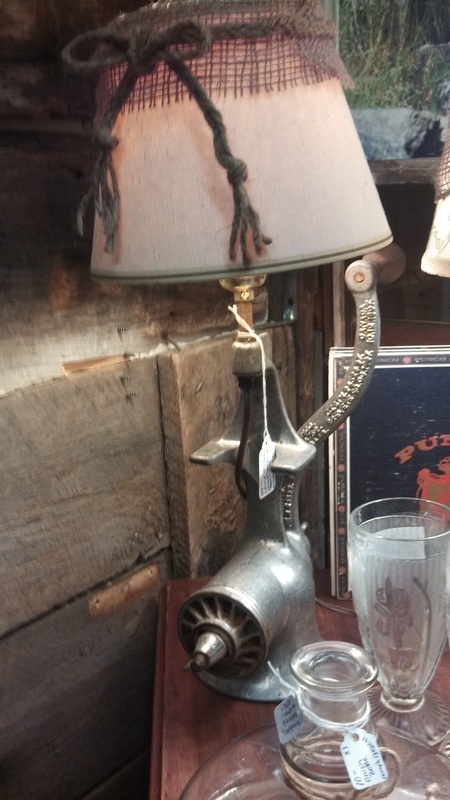 A real CONVERSATION piece - ONLY $40.00 - SOLD over Mother's Day weekend, but SEE above two more UNIQUE lamps at Four Corners Brick House! 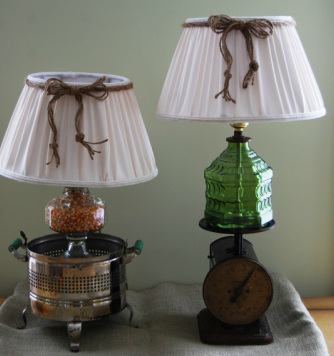 Repurposed Vintage Popcorn Popper and Scale = Lamps! SOLD OCTOBER 2013! UNIQUE ONE-OF-A-KIND Antique Mirror Harp REPURPOSED and embellished with wreath of greens Wall Décor for your Dinning Room, Living Room, Family Room, Bedroom, Study or Office! Only $95! SOLD!!! 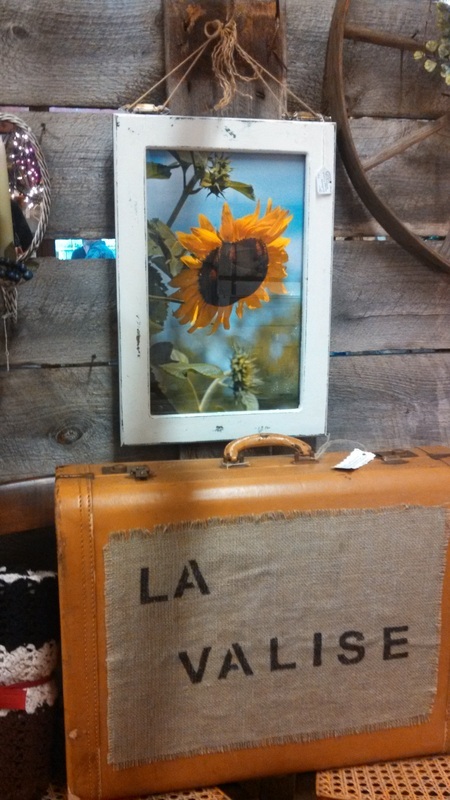 La Valise = THE Suitcase - Vintage Leather suitcase REPURPOSED into a great display piece for STORAGE of old photographs, magazines, etc. - you get the idea - Embelished with a little French and of course some Burlap/(current fashion) - Only $35.00 (in storage - contact me. 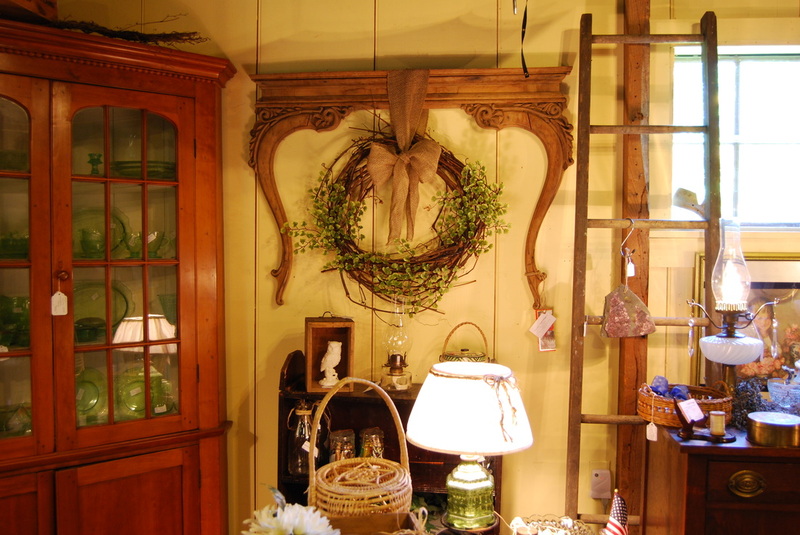 )* * * * * * * * * * * * * * * * * * * * Visit Oomph Redesigns at Four Corners Brick House in Gilmanton, NH! If interested in a particular item, you may contact me .